Providing you the best range of micro leak detector with effective & timely delivery. 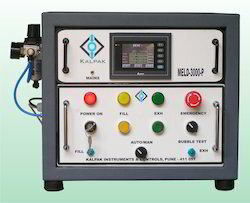 Kalpak Micro Leak detector MELD-2000 is Pressure Decay type programmable leak tester capable of easy and accurate volume leak testing using dry air as source. It is based on the principle that any pressure charged component if leaky, will exhibit negative pressure difference with reference to time. This difference is measured and compared with the preset permissible value to provide go-no go sorting provided with audio-visual indication. MELD-2000 is quicker & more repeatable than traditional water dunking. It is easy to operate, yet feature rich to meet any complex vacuum leak testing requirements. Looking for Micro Leak Detector ?